The material for this article is from Section I, Chapter 5 of God Betrayed/Separation of Church and State: The Biblical Principles and the American Application. The Endnote has more information on this and other books by Jerald Finney. The complete book will be reproduced in these articles, and the audio teachings on this blog also cover the book in abbreviated form. “GOD saw that the wickedness of man was great in the earth, and that every imagination of the thoughts of his heart was only evil continually. And it repented the LORD that he had made man on the earth, and it grieved him at his heart…. And God looked upon the earth, and behold, it was corrupt; for all flesh had corrupted his way upon the earth. And God said unto Noah, the end of all flesh is come before me; for the earth is filled with violence through them; and, behold, I will destroy them with the earth.” After the flood, “[T]he LORD said in his heart, I will not again curse the ground any more for man’s sake; for the imagination of man’s heart is evil from his youth; neither will I again smite any more every thing living, as I have done” (Ge. 6.5-7, 12-13; 8.21). “And surely your blood of your lives will I require; at the hand of every beast will I require it, and at the hand of man; at the hand of every man’s brother will I require the life of man. Whoso sheddeth man’s blood, by man shall his blood be shed: for in the image of God made he man” (Ge. 9.5-6). “God gave man the right to take the life of a man, which in the very nature of the case gave man the authority to govern others. Unless [civil] government has the right to the highest form of punishment, its basic authority is questionable and insufficient to protect properly those it governs” (Charles C. Ryrie, Dispensationalism (Chicago: Moody Press, 1995), p. 53). Although the Bible did not, in those verses in which God first established civil government, call the institution which He ordained at that point civil government, that is what it was. It was the first time God ordained that man was to exercise authority, direction, or control over man. In addition to conscience and the restraint of the Holy Spirit, God instituted civil government. He ordained civil government to secure for man a temporal good—the protection of mankind from violence while on the earth. Only God had the power to prevent civil government, and only God had the power to institute civil government. It was apparent, in context, that He desired man to operate civil government under Him, according to His rules. 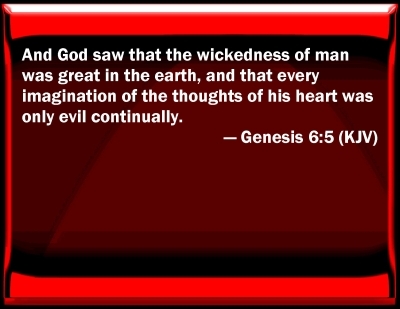 “… God saw that the wickedness of man was great in the earth, and that every imagination of the thoughts of his heart was only evil continually…. 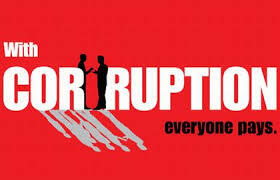 And God looked upon the earth, and behold, it was corrupt: for all flesh corrupted his way upon the earth. And God said unto Noah, The end of all flesh is come before me; for the earth is filled with violence through them: and behold, I will destroy them with the earth” (Ge. 6.5, 12-13). “[A]nd the Lord said in his heart, I will not again curse the ground any more for man’s sake; for the imagination of man’s heart is evil from his youth; neither will I again smite any more every thing living, as I have done” (Ge. 8.21). “Why has government been instituted at all? Because the passions of men will not conform to the dictates of reason and justice without constraint” (M. Stanton Evans, The Theme Is Freedom (Washington, D.C.: Regency Publishing, 1994), p. 193 cited in William P. Grady, What Hath God Wrought? (Knoxville, TN: Grady Publications, Inc. 1999), p. 72). “(1) The relation of man to the earth under the Adamic Covenant is confirmed (Gen. 8.21). “(2) The order of nature is confirmed (Gen. 8.22). 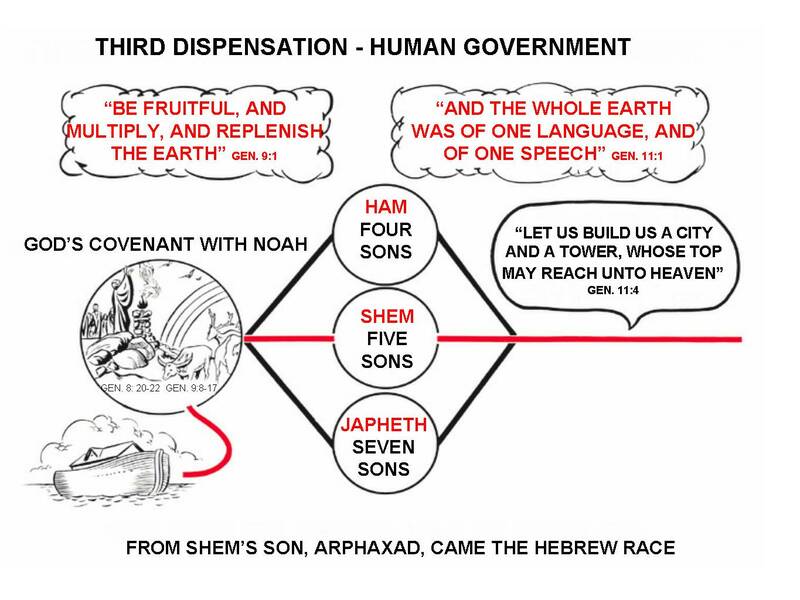 “(3) Human government is established (Gen. 9.1-6). “(4) Earth is secured against another universal judgment by water (Gen. 8.21; 9.11). “(5) A prophetic declaration is made that from Ham will descend an inferior and servile posterity (Gen. 9.24, 25). (Pastor Joey Faust says of this portion of Scofield’s note: “Scofield’s old note missed the fact that the curse of being servile was on Canaan (only one branch of Ham’s seed). This is why Canaan was dominated by Israel. But the first kingdoms of the world were all Hamite (Nimrod, Egypt, etc. ), until Nebuchadnezzar (Semite) began to rule the world. All subsequent powers were Japhethetic. “I do not think it would serve any purpose to try to make the curse of servitude to be on all of Ham’s seed. This was the error of some postmil preachers in the Southern states. I have two lengthy articles on the southern states, and how they saw the South as the New Canaan, and the actual Kingdom of God. These quotes are online at http://www.kingdombaptist.org under Baptist history, etc.”). “(6) A prophetic declaration is made that Shem will have a peculiar relation to Jehovah (Gen. 9.26, 27). All divine revelation is through Semitic men, and Christ, after the flesh, descends from Shem. “(7) A prophetic declaration is made that from Japheth will descend the ‘enlarged’ races (Gen. 9.27). Government, science, and art, speaking broadly, are and have been Japhetic, so that history is the indisputable record of the exact fulfillment of these declarations” (1917 Scofield Reference Edition, n. 2 to Genesis 9.1, p. 16). God ordered man to multiply and populate the earth: “And God blessed Noah and his sons, and said unto them, Be fruitful, and multiply, and replenish the earth” (Ge. 9.1). Would man obey God on the basis of conscience, the restraint of the Holy Spirit, and human government? 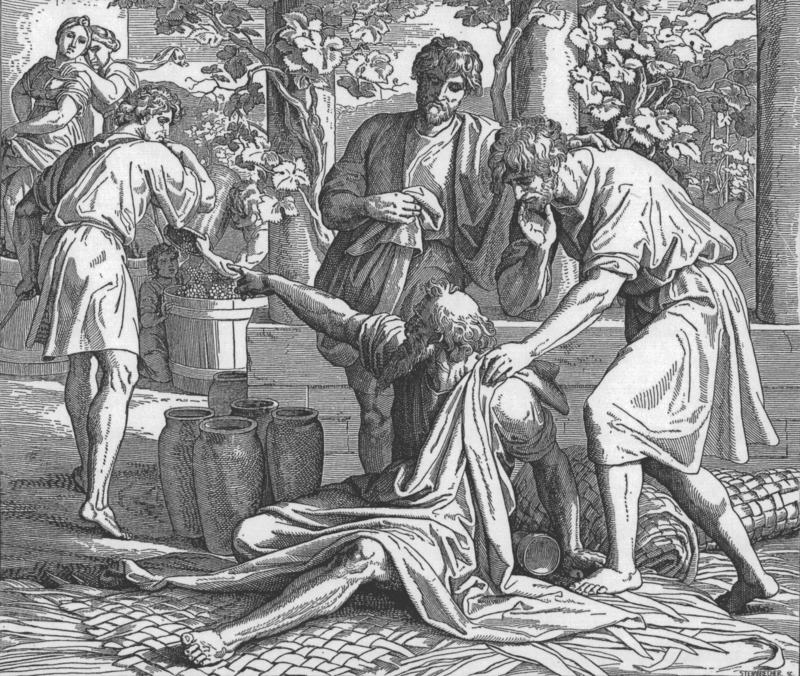 Man almost immediately failed to govern under God—Noah became drunk and incapable of ruling. Furthermore, Noah’s descendants rebelled against God’s command to populate the whole earth. The pattern has continued with every nation that has ever or will ever exist until Christ returns. 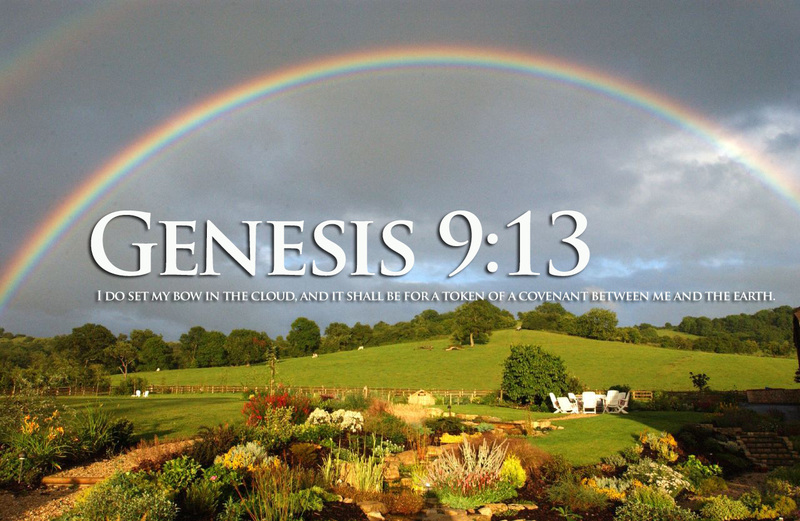 The covenant God made with Noah was to continue: It was to be an “everlasting covenant” (Ge. 9.12) for “perpetual generations” (Ge. 9.16). Thus, the covenant is in effect today. “Rulers are sinful and given too much authority can become oppressive tyrants. Nations check each other’s power. A one-world government would have no check on its power. No one could check violations on legal limitations and guarantees. World government has the potential for world tyranny” (John Eidsmoe, God and Caesar: Biblical Faith and Political Action. (Eugene, Oregon: Wipf and Stack Publishers, 1997), p. 210). 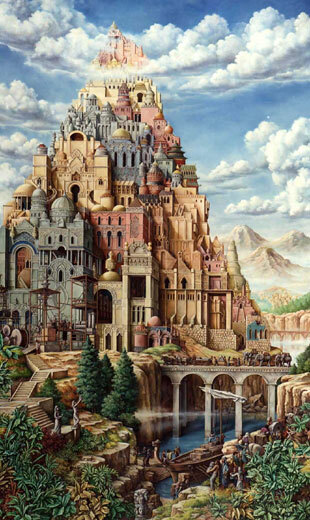 “As we can read in Genesis 11.5-9, God frustrated the building of the tower by causing the people to speak different languages. God then reaffirmed nationalism: ‘And from thence did the Lord scatter them abroad upon the face of all the earth’ (Genesis 11.9). God further reaffirms nationalism in Deuteronomy 32.9 and Acts 17.26. National entities will continue even during Christ’s millennial rule on earth (Isaiah 2.4; 66.18; Revelation 12.5; 20.3, 8), and perhaps even in heaven (Revelation 21.24, 26)” (Eidsmoe, God and Caesar, pp. 210-212, citing The Complete Works of Flavius Josephus (Grand Rapids: Kregel, 1974), p. 30). Thus, God again judged man for his failure to keep His command to populate the whole earth. God confused their language. Since they could no longer speak the same language, the builders could no longer understand one another. They separated and relocated to different parts of the earth. They began to populate the entire earth. “For rulers are not a terror to good works, but to the evil. Wilt thou then not be afraid of the power? do that which is good, and thou shalt have praise of the same: For he is a minister of God to thee for good. But if thou do that which is evil, be afraid; for he beareth not the sword in vain: for he is a minister of God, a revenger to execute wrath upon him that doeth evil” (Ro. 13.3-4; see also, 1 Pe. 2.13-14). “Knowing this, that the law is not made for a righteous man, but for the lawless and disobedient, for the ungodly and sinners, for unholy and profane, for murderers or fathers and murderers of mothers, for manslayers, For whoremongers, for them that defile themselves with mankind, for menstealers, for liars, for perjured persons, and if there be any other thing that is contrary to sound doctrine; According to the glorious gospel of the blessed God, which was committed to my trust” (1 Ti. 1.9-11). “I exhort therefore, that, first of all, supplications, prayers, intercessions, and giving of thanks, be made for all men; For kings, and for all that are in authority; that we may lead a quiet and peaceable life in all godliness and honesty. For this is good and acceptable in the sight of God our Saviour; Who will have all men to be saved, and to come unto the knowledge of the truth. For there is one God, and one mediator between God and men, the man Christ Jesus; Who gave himself a ransom for all, to be testified in due time” (1 Ti. 2.1-6). For example, an application of God’s principles in civil law would be laws regulating hunting. In the Noahic covenant, mankind is told: “Every living thing that liveth shall be food for you” (Ge. 9.3a). Thus, God gave man the authority to hunt animals, but not the “right to engage in mass and wanton slaughter of the animal kingdom.” On the other hand, God placed man in the Garden of Eden to “dress it and keep it” (Ge. 2.15), not to destroy it. “So God requires man to exercise wise stewardship in his use of the animal kingdom and of natural resources in general” (Eidsmoe, God and Caesar, p. 8). God wants every Gentile nation to choose to operate under Him—that is, under His principles as given in His Word. If a nation will do that, Christians will live a quiet and peaceable life and non-Christians will be free to choose God, no god, or false gods or gods since, as will be seen in later articles (See also, Section III of God Betrayed/Separation of Church and State: The Biblical Principles and the American Application), separation of church and state is a biblical principle for Gentile nations. “American law tended to operate as if it had a life of its own, shaping society to conform to legal values by directing the actions of individuals. Recognizing law’s relative autonomy, scholars such as Michael Grossberg, Christopher Tomlins, and Mark Tushnet contend that law acted to infuse the new society—including the judges—with a system of rules and principles derived from liberal ideology. Many authors have noted the incremental pace of legal change. Law’s structural dependence on the Constitution, common-law precedent, and the procedural dictates of pleading recognizable legal arguments mitigated any societal tendencies toward rapid transformation. Instrumentalism, as a theory of understanding law, fails to fully appreciate its institutional inertia, the multiplicity of forces involved in its creation, and its hegemonic role as a relatively autonomous body of values, beliefs, and doctrine that provides the means of ‘discourse’ in a nation of law” (Mark Douglas McGarvie, One Nation Under Law: America’s Early National Struggles to Separate Church and State (DeKalb, Illinois: Northern Illinois University Press, 2005), p. 12). 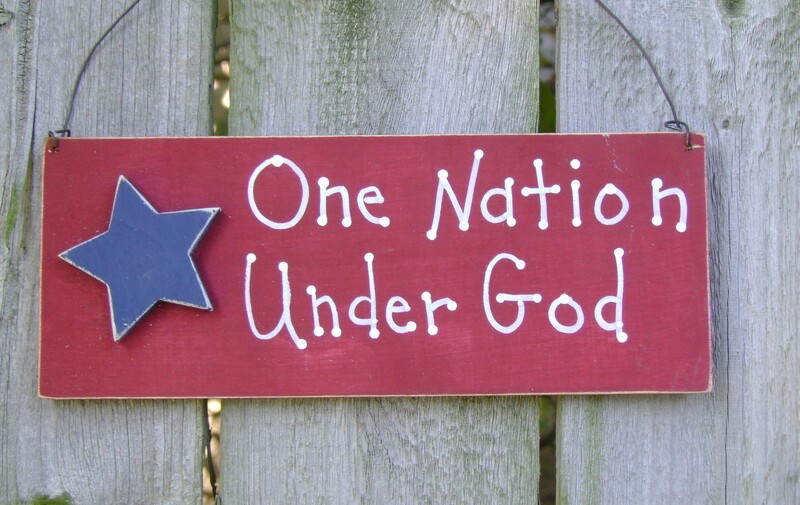 A nation under God will base its law upon biblical principles and such a civil government teaches its citizens the biblical principle that they have freedom of conscience (See Section III of God Betrayed/Separation of Church and State: The Biblical Principles and the American Application), but that individuals should choose to conform their wills to the will of God. Everyone in such a nation may choose the one true God, god, gods, or no gods at all. If under God, a nation teaches and points to truth, including the ultimate truth that Jesus stated: “I am the way, the truth, and the life: no man cometh unto the Father, but by me” (Jn. 14.6). This is why it is important, for example, that government leaders, officials, and others pray in no other name than the name of Jesus. On the other hand, a nation which is not under God teaches the principles of Satan, the god of this world. A civil government not under God will allow or require official government prayers in the name of any god, no god at all, and perhaps also in the name of Jesus. The Noahic Covenant was written to Gentile nations. Gentile nations were to always proceed under God’s original plan for civil government. Later, as will be shown, God called out a nation, Israel, for specific purposes applicable only to that one nation. Israel was to operate as a theocracy directly under God. Israel was to be the center of God’s dealings with nations. God’s treatment of every Gentile nation depended and depends upon that nation’s treatment of Israel. Thus, the Bible teaches that God can prevent man from setting up civil government, and He can ordain civil government. He is the Highest Power. At the same time, because God has given man free will, God does not force civil government to operate under Him and within the sphere of its God-given authority. Regardless, all other powers, including all other governments and civil government officials and leaders are under the Supreme Government and subject to His rules. “Let every soul be subject unto the higher powers. For there is no power but of God: the powers that be are ordained of God” (Ro. 12.1). All that God showed man as recorded in the Old Testament failed to convince mankind, excluding a remnant, that God was who He claimed to be, that His rules and principles could not be changed, that judgment falls upon individuals and institutions which do not operate according to His principles. As Isaac Backus observed: “Yet all this [all that God had done in the Garden of Eden, the flood, the ordaining of civil government] did not remove the dreadful distemper from man’s nature, for the great Ruler of the universe directly after the flood gave this as one reason why he would not bring such another while the earth remains, namely, For the imagination of man’s heart is evil from his youth” (Backus, Isaac. “An Appeal to the Public for Religious Liberty,” Boston 1773, an essay found in Isaac Backus on Church, State, and Calvinism, Pamphlets, 1754-1789, Edited by William G. McLoughlin. Cambridge, Massachusetts, 1968, p. 310, citing Ge. 4.19; 6.13, 15; 8.21). “So that if he was to drown them as often as they deserved it, one deluge must follow another continually” (Ibid., pp. 310-311). Having ordained civil government, God desires nations to know Him, to operate under Him according to His principles, and to glorify Him. This is clearly taught in the Word of God. That will be the subject of the next article.